Thunder head coach Scott Brooks gives a referee his thoughts before being slapped with a technical foul Tuesday night. D.J. Augustin looks to pass the ball while being guarded by two San Antonio defenders. Russell Westbrook drives to the basket while being guarded by Aron Baynes. Oklahoma City's Anthony Morrow, left, battles Marco Belinelli for a loose ball during Tuesday's Western Conference matchup. The Spurs defeated OKC, 113-88. Russell Westbrook knocks the ball away from Tony Parker. Westbrook finished with 17 points, two rebounds and two assists. 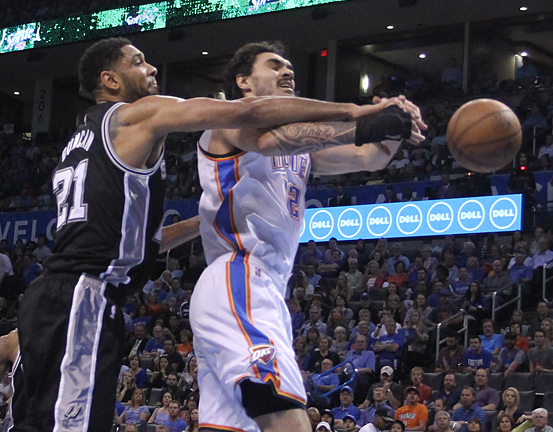 Steven Adams, right, and Tim Duncan battle for a loose ball. Oklahoma City set a new team record Tuesday night but it wasn’t pretty. The Thunder tallied only 10 points in the first quarter, setting a new record for the fewest points scored in a quarter. From that point, the visiting San Antonio Spurs rolled to another blowout win over the Thunder by a 25-point margin, 113-88. The Spurs dominated Oklahoma City, 130-91 on March 25. The loss is the Thunder’s fourth in a row, dropping Oklahoma City to 42-36 overall. The loss combined with New Orleans’ 103-100 win over Golden State dropped Thunder into ninth place in the Western Conference. The Pelicans now lead Oklahoma City by a ½ game for the eighth and final playoff spot in the West. San Antonio is the first team to defeat Oklahoma City by 25 points or more twice in a season since the 2008-2009 campaign. Oklahoma City never led as the Spurs jumped out to a quick lead and never looked back. At the 6:02 mark of the first quarter, Brooks was called for a technical foul after a frustrating start that included several missed calls by the officiating crew. However, the technical did little to inspire the Thunder as San Antonio outscored Oklahoma City 18-5 the rest of the quarter to lead 29-10. The Thunder shot only 19 percent in the first quarter compared to 60 percent for San Antonio. The Thunder made it competitive in the second quarter, drawing to within 38-24 as Andre Roberson nailed one of Oklahoma City’s five three-point shots. From that point, the Spurs outscored the Thunder, 25-17, to lead 63-41 at halftime. Oklahoma City never trailed by fewer than 21 points during the second half as Thunder starters were pulled midway through the third quarter. The Spurs’ largest lead was 34 points. Although he played only 26 minutes, Russell Westbrook led the Thunder in scoring with 17 points followed by bench player Jeremy Lamb with 11 and Perry Jones and Dion Waiters with 10 each. San Antonio was led by Kawhi Leonard with 26 followed by five other Spurs in double figures. Popovich showed some regret that San Antonio wasn’t able to play a Thunder team at full strength. For the game, San Antonio shot 52 percent from the field compared to 40 percent for the Thunder. Three-point ace Anthony Morrow missed all three of his attempts from behind the arc and usually-reliable Enes Kanter was a woeful three of nine from the field. Oklahoma City and San Antonio each scored 50 points in the paint as the Thunder tallied more second chance and fast break points. GAME NOTES: The Thunder didn’t look like the top rebounding team in the NBA as the Spurs collected more boards, 46-39, including 12 offensive caroms…Oklahoma City hosts Sacramento Friday night while New Orleans plays at Memphis on Wednesday before playing at home against Phoenix on Friday…As a usually-reliable free throw shooting team, Oklahoma City hit only 15 of 28 charity attempts…Both teams committed 15 turnovers…On a bright note, the Thunder notched 13 steals against the Spurs.